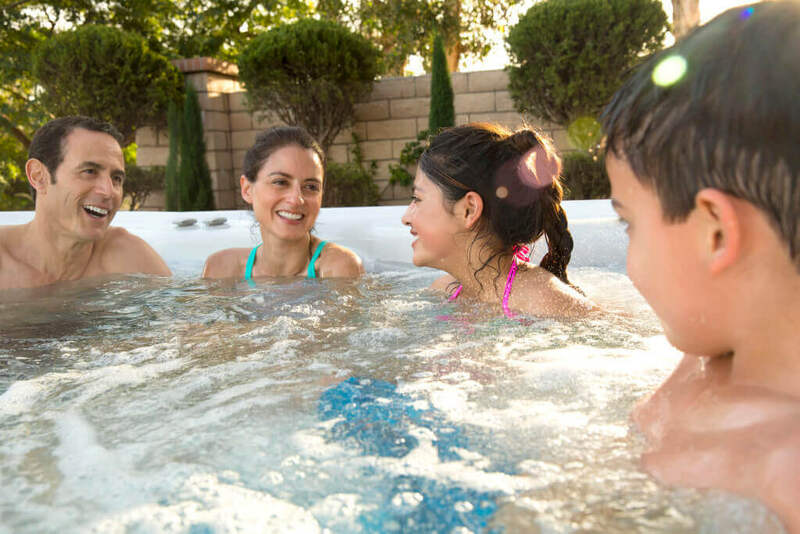 Although great for entertaining your friends at parties and spending some quality time together with a loved one, it isn’t just adults that can benefit from a hot tub. In fact, children will really have a great deal of fun sitting in front of the powerful jets and splashing about in the warm water. In fact, children seem to have an innate natural affinity with water from a very young age, perhaps they really are water-babes after all! Even so, it is important to remember that youngsters under five as well as children who cannot stand on the bottom with their head above the water should never be allowed to use a hot tub un-supervised. What’s more, it often helps to introduce a few additional safety measures to make sure nobody gets hurt. With appropriate precautions in place, you can then think of ways to make the most of your hot tub. Consider additional safety features – If there are steps or stairs leading up to your hot tub, it makes sense to cover them in a slip resistant material. You may want to put up a guardrail to hang on to as well. Also, think about equipping your spa with some jump seats, which will allow kids to sit in waist-deep water safely. Keep an eye on the temperature – Despite the fact hot tubs can go up to 42C, this is usually much too high for children. Therefore, keep a close eye on the temperature and set it around the 37C mark. Introduce time limits – Seeing as kids can get dehydrated easily from staying in a hot tub for too long, introduce some time limits depending on how old your children are. Ensure they always drink plenty of water too. Come up with a set of rules – Kids might not like the idea of hot tub rules, but they are often essential. For example, getting in without an adult’s permission or messing with the hot tubs controls can have serious repercussions. Movie night – With wireless TV and sound systems available from HotSpring World, you and your children can escape the living room and have a movie night from inside the comfort of your very own hot tub. Musical jets – Exactly the same as musical chairs but with your hot tub jets instead. Play some music while walking around your spa but when the pause button is pressed, everyone must stand still. If you aren’t in front of a jet, you have got to get out! Hockey – Place a ping-pong ball in the middle of the water between you and your children. Using your hands to splash or mouth to blow, you must get the ball to the other side to score a point! The first to three is the winner! Hot tub party – Chances are your children will brag to their friends at school about your hot tub, but there is no reason why they too can’t join in from time to time. So, for your children’s next birthday, throw a hot tub-themed party. Having fun with Hot Tubs is what we are all about; get in touch with your local HotSpring World showroom for some more family fun ideas!